Since its launch in January 2005 the 206 Sport has become the best selling 206 model, accounting for over one third of all 206 retail sales in 2005. This successful formula has now been strengthened further with the introduction of two new engine options and further improvements to the already comprehensive standard specification. Based on the recently deleted XSi, the new 206 Sport benefits from an improved standard specification which includes power steering, driver and passenger SMART airbags, remote central locking, electric front windows, stereo radio / mono CD player, sports front seats, air-conditioning, full body coloured exterior, 14" or 15" alloy wheels (14" wheels are fitted on 1.1 and 1.4 litre models), front sports wings (1.6 and HDi models), trip computer / external temperature gauge, front fog lights and aluminium interior detailing. Two body styles – three and five door – are available. 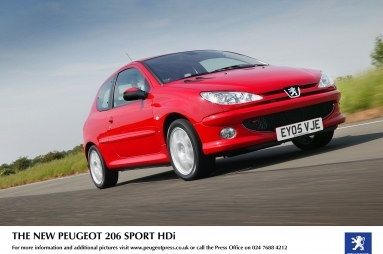 (The 206 Sport was the first 206 in the Sport range to be available with a five door option.) Three petrol engines and two diesel engine options are now available. Petrol engines consist of a 1.1 litre 8V engine which produces 60 bhp, a 1.4 litre 16V engine producing 90 bhp and a 1.6 litre 16V engine producing 110 bhp. Sporty diesels have long been part of the Peugeot range since the introduction of the 205 Dturbo and the 206 Sport continues this tradition. Two diesel engines are now available, Peugeot’s legendary 2.0 litre HDi diesel engine producing 90 bhp or Peugeot’s class leading Euro IV compliant 1.6 HDi diesel engine, producing 110 bhp and fitted with a particle emission filter. To make this car stand out from the crowd a Black / Red or Black / Grey Merlin cloth interior is matched to five lively exterior colours: Flamenco Red, Iron Grey, Moonstone, Onyx Black and Aluminium. The competitive pricing of the 206 Sport remains the same at £8,995 for the 1.1 three door model rising to £12,095 for the new 206 Sport HDi 110 five door model.